Problem: Municipal wastewater treatment facilities are extremely energy-intensive and costly to operate and maintain. Traditional systems use UV or chorine chemicals to treat the wastewater. 1. 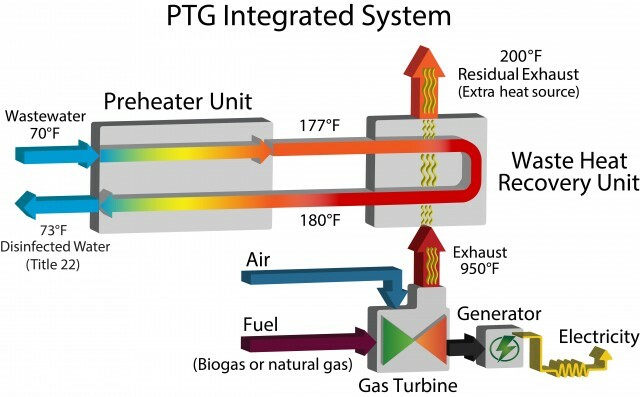 The Pasteurization Technology Group (PTG) has developed a patented “two-for one” technology that combines renewable energy generation with wastewater disinfection technologies. 2. Their system uses biogas, a natural byproduct of wastewater treatment to drive a turbine that generates renewable energy. About 30 percent of the energy created by the turbine generates electricity while the waste heat is passed through a waste heat recovery unit (CHP) to increase the temperature of the wastewater to around 165 degrees to disinfect water. Heat has always been an effective way to disinfect water, but the high expense of traditional heating methods prevented it from being an accepted alternative to UV or chorine. 3. This process has met the standards set by California for disinfection of water for reuse. 4. The system’s software allows off-site control. 5. In addition to waste water treatment, this technology can be used in water- and energy-intensive commercial industries including agriculture, beer, and beverage and food processing. 6. The company claims significant cost and energy savings in addition to environmental benefits from reduced chemical treatment. 7. PTG has won numerous awards including the Water Environment Federation (WEF) Innovative Technology Award, the Katerva Award, the Artemis Top 50 Water Tech award. 1. Municipalities charged with waste water treatment. 2. Water and energy-intensive commercial companies. 3. Government regulators, policy makers, and planners. 1. Proof of concept through rigorous testing of the systems culminating in white papers and case studies. 2. Targeting of municipalities and commercial customers. 3. Integration of other technologies to push down costs and chemical and energy use. This is a wonderful technology that should be very attractive to municipalities as well as commercial companies in terms of cost, as the system can cut disinfection costs by 50% and energy costs by 40-50%, and the system can be designed around already existing turbines and engines.